At long last, I can finally share my home tour with you! 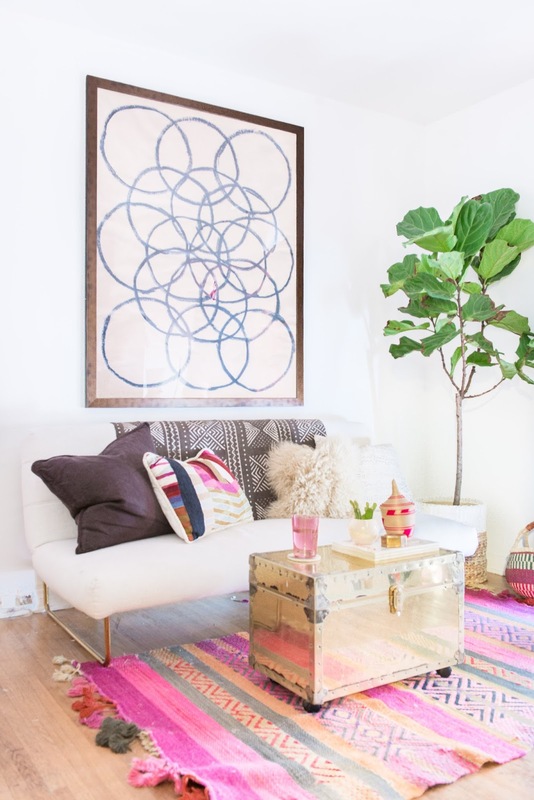 The lovely gals over at Glitter Guide asked to share the #bohobeachbungalow, and the amazing Carley Rudd shot the feature. We moved into a house just over a year ago in Santa Monica, and I'm thrilled to leave apartment living behind me. The neighborhood is great and we can bike to all my favorite spots in Venice and Santa Monica, and we have a great little yard for our newly adopted pup, Dakota, to run around in. 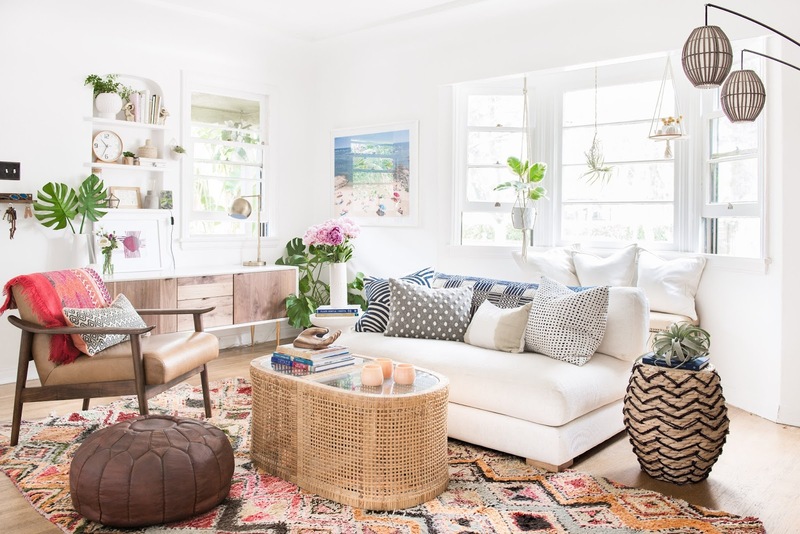 Over the next few weeks I'll be sharing in depth posts of the Boho Beach Bungalow and the design process for each room, and for more photos from Carley of my home and their interview with me, head on over to Glitter Guide! Here's the living room. Before we moved in, I had the whole house painted Benjamin Moore's Super White. I like to experiment a little with color, so having a blank canvas that wouldn't compete with any other accents was essential for me. I did my best to take my time decorating and not be tempted to buy everything all at once. Instead, I slowly collected pieces that I truly love. 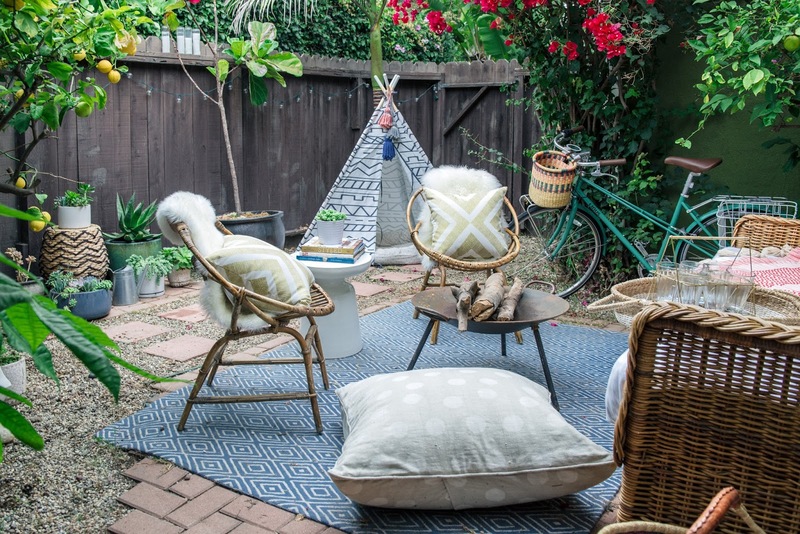 That amazing vintage moroccan rug is from Merchant Modern, and the leather pouf from Venice Vintage Paradise - another one of my favorite vintage shops in the neighborhood. That coffee table is definitely one of my favorite pieces, and I found it on Craigslist for about $75. 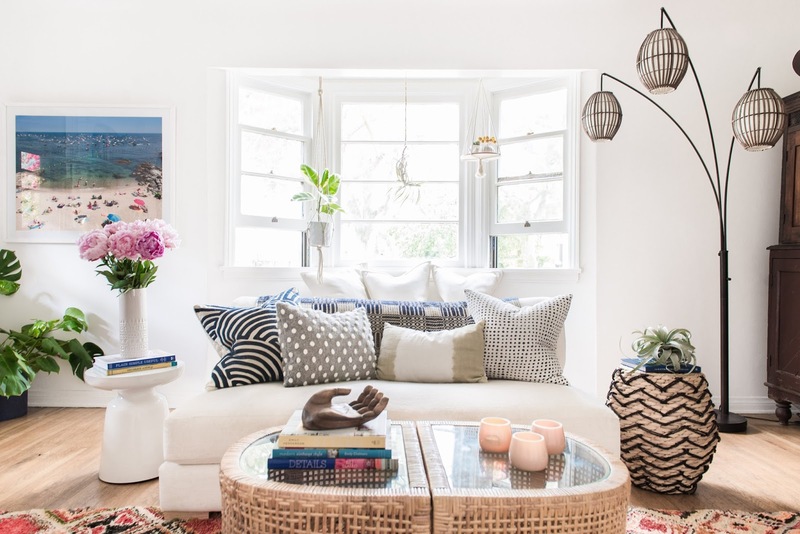 It's got a beachy, relaxed vibe and a beautiful organic shape. One of the best things about it is that it splits in two and can be used as end tables in a future life or if we're entertaining. I love well designed furniture with multiple uses, especially when you're living in a smaller space. Having only ever lived in spaces previously with dining nooks, I was thrilled to have a formal dining room. I love to cook, and now we can sit at the table and have a nice meal without any distractions. You know you're grown up when you have a dining room and actually eat in it. We decided to do a gallery wall here mostly because it was one of the few walls that had enough real estate to house most of our art, working around the built in stained glass window and just treating it like it's own piece. With so much color on the wall, I went neutral with the furniture with a sisal rug, teak dining table and white metal chairs. 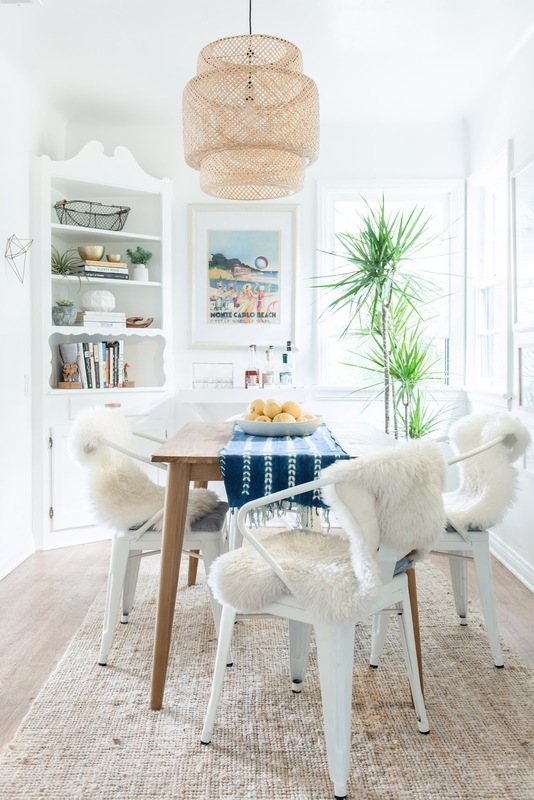 To see more of the dining room and how to get the look, check out this post. One of the things that made the biggest impact in the dining room was switching out the overhead lighting. I have to say, I’ve never done this before in a rental but had a friend show me how and it really is quite simple and makes a world of difference (great tutorial here). The pendant light kit from Ikea was a total bargain and makes a big statement. I agonized over whether or not to buy a bed or a headboard for ages. 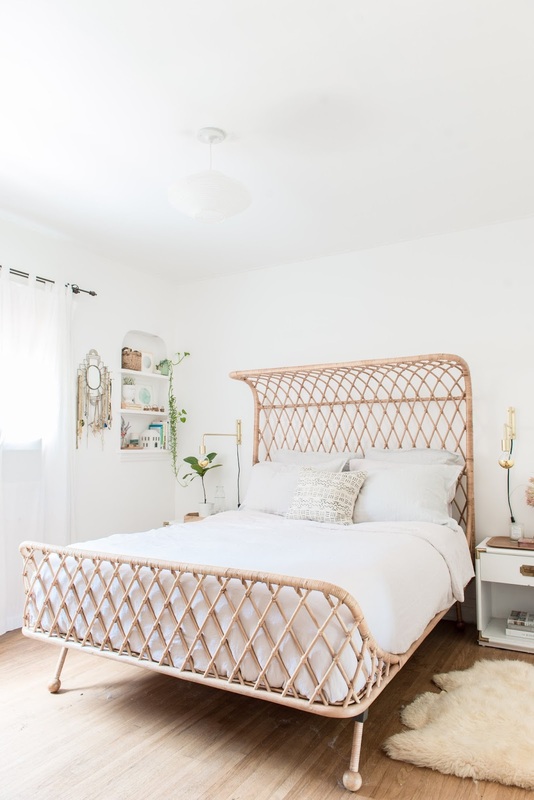 With all the minimal bedrooms out there with neither a frame or a headboard, I considered living without one, but finally settled on this statement rattan bed, and I couldn’t be happier with it! Since the bed is the major piece, I went simple with other elements in the room. I found the vintage nightstands at a flea market and painted them white, and tried to bring in some zen with the sculptural overhead pendant lantern. I brought in some subtle color with warm (dusty pink) and cool (fog grey) tones in the amazing linen bedding from Parachute Home. The plug-in brass wall sconces (great for rentals!) save space on the nightstands and are the perfect height for reading. This room acts as our tv room, office, and guest room with a fold down futon. The guest room is definitely a bit more fun and colorful than the rest of the house with a pink rug, vintage brass chest, and statement art. Since we don’t have guests staying with us all the time we wanted to be able to get use out of the room year round and we can do that with the futon (with brass legs!) for tv watching that folds down to a bed when needed. The desk is a major favorite of mine ever since I found it several years ago at Wertz Brothers. I love the pop of color and campaign style with brass hardware. This space doubles as a workspace and vanity when needed. The guest room leads out a french door to the yard, which is what sold me on this house. Though small, I’ve been able to do a lot with the space. 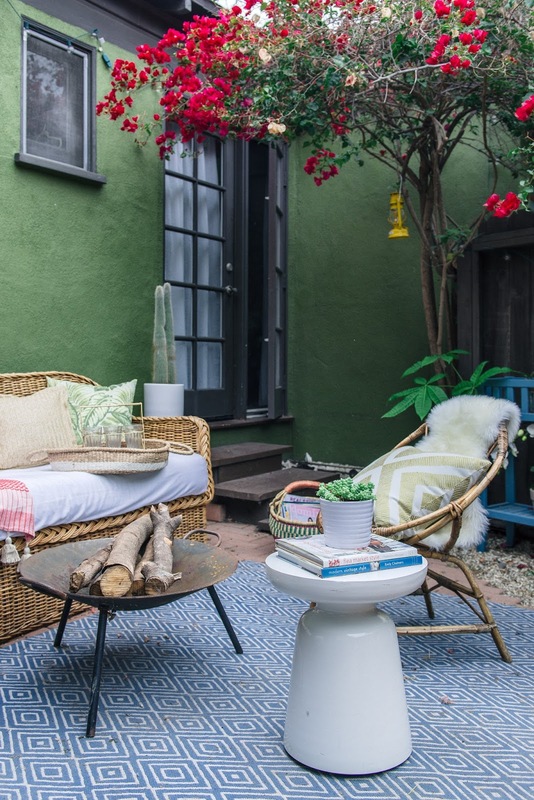 Living in LA is amazing because you can really use outdoor space year round with our sunny, warm weather. I created an outdoor living room with a vintage rattan sofa, fire pit for cooler nights, and our favorite vintage bamboo chairs. A patterned rug segments the yard to create the outdoor living room, and lots of plants play off the lush bougainvilleas and lemon trees. And of course, a comfy spot for our dog, Dakota. 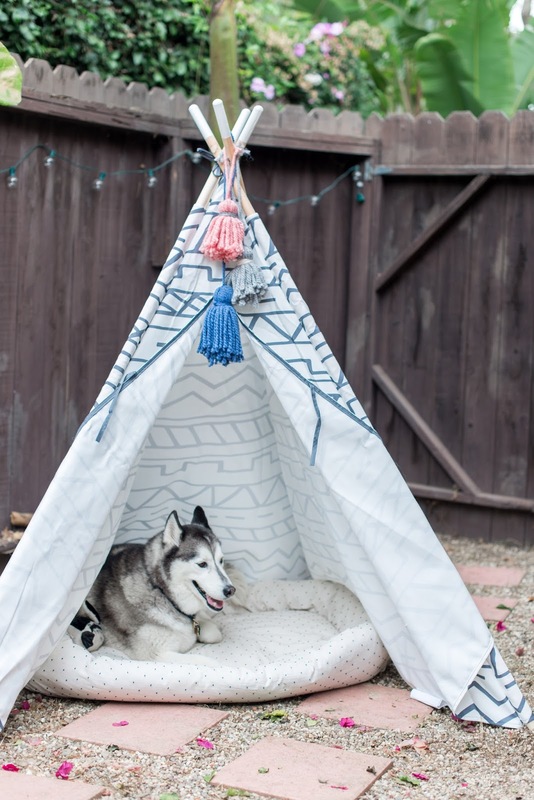 He really insists on only the trendiest of dog houses and won’t spend time in anything other than this uber hip teepee. Over the next few weeks I’ll be sharing in depth posts about the design process for each room, so be sure to check back soon. A huge thanks to Carley Rudd for her amazing photography skills and Glitter Guide for the feature! Hi there! I love your style! 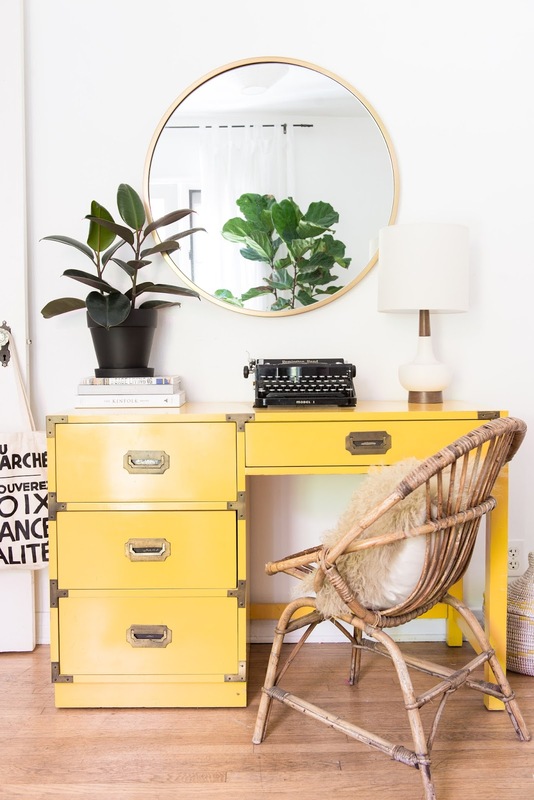 Out of curiosity, would you mind sharing where you found your round mirror that is hung over your beautiful desk/vanity?